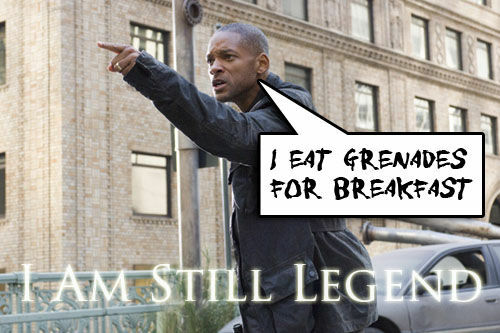 Hmmmm…Didn’t the end of the theatrical version of I Am Legend result in Will Smith being blown to hell by his own grenade? Oh.... uhh… Spoiler alert? A source of Ain’t It Cool News provided them with an interesting possible update to the status of the next I Am Legend film. It was originally thought to be a prequel for the obvious reason that Will Smith’s character, Robert Neville, died at the end of the film. I guess studios will stop at nothing to make a franchise out of something – whether it be prequels, sequels, reboots, etc. In this case though, the source for AICN has yet to be tested so this could all be mumbo jumbo. What do you think of a sequel? What did you think of a prequel? Is this as confusing to you as it is to me?